You know those moments I’m talking about: when you feel that life is completely unfair, like you’ve been singled out by the universe and you don’t understand why you’ve been “cursed” with this unreasonable challenge; when it appears that everyone else around you has been spared from such misery, and it’s only you who has to endure this tortured existence. I had my first real “why me?” moment in 2004. After living with my illness for over two years, I was suddenly challenged with my most trying episode yet. When I began experiencing intense abdominal pain and a spiking fever, I was hospitalized with a mysterious infection and laid in that hospital bed for ten grueling days. For the first few days I was touch and go, the doctors not knowing the source of the infection, nor if I would survive it. As my fever continued to spike, I was depressed and almost inconsolable. Not only was I scared for my young life, but I was also missing a friend’s wedding – a once-in-a-lifetime-event — and this made me outraged. At 30 years old, I was not meant to be lying in this hospital bed fighting for my life. I was, of course, meant to be living my life like the rest of the normal world. I cried each day, feeling sorry for myself and wondering why God would put me in this seemingly merciless place. Meanwhile, one of my oldest and dearest friends, Deanne, was traveling through Ireland with her family. Being abroad, she had no idea I was in the hospital. 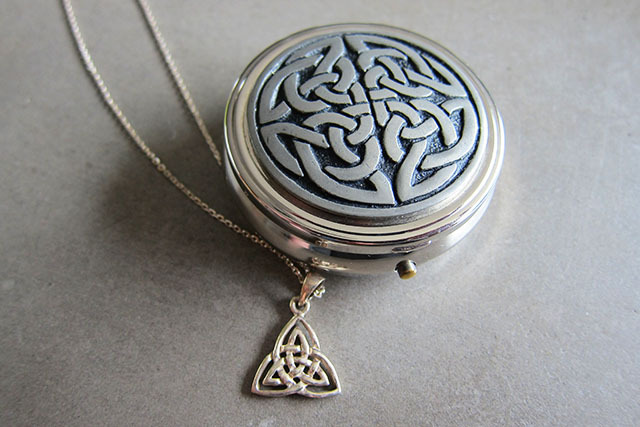 When she returned to the States and found out, she raced to visit me and brought the souvenirs she had bought for me: a necklace and a pill box (oh, how appropriate), both featuring a Celtic knot pattern. Unaware of the meaning of this traditional Irish symbol, I was intrigued to read the inserts. I learned that the Celtic knot represents an eternal life cycle: a never-ending loop, intertwined in twists and turns, but always connected, with no beginning and no end. The Celtic knot is a symbol of faith, representing the interlacing of the physical and the spiritual and the idea that everyone and every event is somehow connected to every other. To me, this means that in this life, there are no coincidences and no accidents. Suddenly, it hit me with the realization: we are all exactly where we are meant to be. It was not a coincidence that Deanne brought me this exact gift during one of the lowest times of my life, having no idea of my suffering at the time, and it was no accident that I was lying in this hospital. These souvenirs reminded me that I wasn’t in the wrong place after all. I was exactly where I was meant to be. I had no idea why at the time, but I began to have faith and trust that notion. I desperately clutched that necklace in my hand every day, and that is exactly what got me through the rest of that hospital stay. Needless to say, I eventually recovered, but that episode profoundly changed me. To this day, it is that Celtic knot necklace and that convenient little pill box that remind me that this is who I am supposed to be. They pose the question: am I cursed or am I blessed? For some time, I thought it was the former. But after all the ups and downs I’ve been through – the excruciating pain, the dreaded surgeries, the episodes of not being able to eat, the loooong hours spent in doctors offices and hospitals — I can finally answer that question with certainty. I am a “sick chick,” and some might see that as a sad stroke of misfortune. But I now know better. I have been blessed with the ability to see the world through a new pair of eyes. I consider every day I’m alive (especially the days when I’m feeling okay) to be a miracle. I know I am blessed because my illness has made me realize and deeply appreciate the facts that I have: amazingly supportive family and friends; a loving husband who holds down the fort, takes care of our family and our household on the days when I can’t, and makes it so I can afford healing foods and supplements which are critical to my health; a comfortable home; oh yeah, and I have medical insurance! This means access to some of the best doctors, medications and treatment. Not everyone on this planet has all these things. And a lot of those who do, have no idea how fortunate they are. Sometimes we take these things for granted. In addition, my illness has given me empowerment, strength and resilience. It’s taught me to be more understanding and compassionate towards others and not to sweat the small stuff. It’s started me on a path to better health and taking responsibility for my body, enriching my existence and making life more meaningful every day. I now know that I’m not cursed; I am blessed…and I am exactly where I’m meant to be. Wow. I loved this! I'm sure you can understand why. I believe whole-heartedly with everything you just said…and said beautifully, I might add. Love love love!! I seriously just read this 3 times over! Thanks so much, Amy! I know you understand firsthand. I appreciate your encouragement, and you know I love your blog and the way you express your own experiences too!